Microsoft moved to the next stage of anti-piracy in its release of the Office Genuine Advantage (OGA) update. It was released last week as an Important update and checks Office XP, Office 2003 and Office 2007 installations. "Office Genuine Advantage Notifications (KB949810) Download size: 712 KB Update type: Important Office Genuine Advantage Notifications is part of Microsoft’s effort to reduce software piracy. Installing this software will help confirm that the copy of Office install on this computer is genuine and properly licensed. If the copy of Office installed on the computer is not genuine, the software will provide periodic reminders to help you take appropriate action and protect yourself from security threats posed by counterfeit software." Regardless of whether you have Automatic Updates set to automatically download and install, it is necessary to approve the license agreement before the OGA installation will continue. Note that OGA cannot be removed after installation nor can the messages be stopped if your Office installation fails the anti-piracy test. In the event you receive a "This copy of Microsoft Office is not genuine" message after installing OGA, please visit Genuine Microsoft Software and click on Validate Office, then restart your computer. Be careful to avoid the pitfalls described in the predictions described by Tom Kelchner of Sunbelt Software.
" -- A news story in the next few weeks about somebody’s discovery of a mechanism to defeat or sidestep OGA security. -- The availability of patches, or entire reverse engineered Windows operating systems and Office versions that suppress or evade the OGA nag screens. The pirated apps will probably attempt to evade updates. The net result will be that they also will avoid patches for newly discovered vulnerabilities. -- Trojanized Windows Office versions that are distributed as apps that evade the Windows Genuine Advantage mechanisms. -- Malicious spam advertising the above. -- Yet more bot-riddled machines in China." Only get Microsoft updates from Microsoft Update or Automatic Update, not third parties. Remember, Microsoft updates are never sent via e-mail nor are they advertised or available on non-Microsoft websites. For additional information on OGA Notifications, please visit Genuine Office Support. "As the piracy trade becomes more sophisticated, the Microsoft Office Genuine Advantage program adopts an end-to-end approach to protect Office customers from the risks of counterfeit software." "According to the Environment Protection Agency, IT accounts for 2% of all power consumption in the nation, and the government is the largest energy consumer in the country spending $293 million annually just to power its PCs. 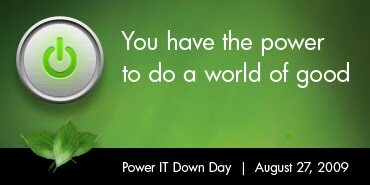 As federal agencies work to reduce energy consumption for cost-savings and environmental benefits, Power IT Down Day focuses on the little things that we as individuals can do to support energy efficiency. To join the cause, you just have to pledge to turn your computers, printers, monitors and other IT devices off at the end of the day on August 27. When just one person leaves this type of equipment turned on overnight, he or she wastes approximately 13 kilowatt hours. Last year, 2,800 people participated, saving more than 37,000 kilowatt hours in one night." The confirmation e-mail will include that your commitment to save energy will be added to the total savings calculation. A portion of the cost savings will be donated to the Wounded Warrior Project. A family member has a special birthday coming up and I had thought to create a collage of pictures from old photograph albums created prior to the digital era. Then, last week, I followed a Twitter link announcing the release from Beta of the new Windows Live Movie Maker. After I read about the new Windows Live Movie Maker and watched the brief video “Introduction & Walk-through”, I thought it might be fun to give it a try. Please understand that I have tried programs like this before, only to give up because they did not work as described or were much too complicated for my purposes. But the Windows Live Movie Maker sounded simple enough and I soon discovered how simple it is to use. In fact, the only time-consuming part of the project was selecting the photographs to include in the movie. (I don’t think that I should mention the time spent with at least a half-dozen family albums spread around me as I relived the memories invoked by all those pictures.) After scanning the pictures with my Kodak EASYSHARE Printer, I used Windows Live Photo Gallery to easily adjust and crop the the pictures. Since the special birthday has not arrived yet, I cannot share that movie with you. Instead, allow me to illustrate how easy it is to create a simple project – so easy that I know you can do it too! Now all you need to do is navigate to where your stored images (or videos) are stored on your computer. Select the images you want to include in the movie and drag them to the Movie Maker window. Windows Live Movie Maker will format the images for your movie. Add a Title, caption images as desired and complete the credits. The options are also available as easy picks from the ribbon: and that is all there is to it! You have a finished product: "It's So Easy". There are many early adapters of Windows XP who skipped the move to Windows Vista but have decided to upgrade to Windows 7. For those people, there will be some changes in the look and feel of Windows. Not to worry, Andre DaCosta prepared a quick guide with side-by-side image comparisons to help new Windows 7 users become familiar with some of the changes and benefits of Windows 7. See Andre's article in For the 'former' Windows XP User - Welcome to Windows 7! Reported Accessibility Improvements: "Tab and Crtl+Tab functions cycle focus from the tab (labeled as a button), though all of the controls on that page then back up to the tab. Left and Right Arrows navigate between the tabs." Effective August 1, 2009, Microsoft discontinued support for "Office Update" and the "Office Update Inventory Tool". Aside from security updates, in order to continue obtaining the latest updates for Microsoft Office products, use either Microsoft Update or Automatic Update. Answers to Frequently Asked Questions are available at Office Online. Why is Microsoft decommissioning the Office Update service? What benefits do I receive by using the Microsoft Update service? What will happen if I attempt to access the Office Update website after August 1, 2009? I am running Windows Vista. Will my servicing experience be different? Will I still be able to use the Office Update Inventory Tool to deploy Office updates? I use SMS to deploy my Office updates. How does this affect me? I use Microsoft Baseline Security Analyzer (MBSA) to determine the security state of my computer systems. How does this affect me? How will I maintain my existing Office administrative installation point after the Office Update service is decommissioned? The Microsoft Office Sustained Engineering blog announced that distribution of Service Pack 2 (SP2) for the Microsoft Office 2007 system will begin via Automatic Update during the week of September 21, 2009. 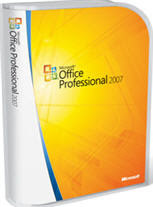 A description of the Microsoft Office 2007 SP2 and Microsoft Office Language Pack 2007 SP2 is available in Knowledge Base Article 953195. For a list of all 2007 Office system SP 2 as well as Windows SharePoint Services 3.0 Service Pack 2 see Microsoft Knowledge Base Article 968170. Additional information regarding the service pack is available in the Microsoft PressPass interview of Jane Liles, group program manager, Office Sustained Engineering: Office Service Pack 2 Q&A. Time is running out if you are contemplating an upgrade but would like to test drive Windows 7 first. The Windows 7 Release Candidate (RC) is an ideal way to test the operating system in a non-critical environment. However, downloads will end on August 20, 2009. Full details are available at TechNet in Windows 7 Release Candidate. There is a wealth of information available on Windows 7. For starters, see the list below. If you are a Windows XP users, the activation process will be new to you. A brief demonistration is available in Activating Windows 7. TechNet Magazine has a compilation of tips for Windows 7 at Windows 7 beta 1 Tips. For more in-dept information, Talking About Windows provides a behind-the-scenes look at the next generation of Windows. It is a video blog with contributions provided by Microsoft engineers who helped build Windows 7. Should you need assistance, Microsoft Answers is a great source to get help. The Getting Ready for Windows 7 Forum is dedicated to help you learn about Windows 7, and get help with installation and upgrade of the Release Candidate. The Microsoft Update Product Team Blog posted an update today that the previously announced upgrade to the Windows Update and Microsoft Update services started today, although it will take several months to complete. Unless Windows Update (or Automatic Updates) is disabled, regardless of your settings, the upgrade will be downloaded and installed automatically. Additional information is available in my previous post, Important: Upcoming Upgrade for Windows Update. The Best Windows Website Contest -- Have You Voted? The Windows Club, "Best Windows Website, 2009" contest has moved to the popular vote phase. From among the 60+ participants, the individual rankings of each of the judges, viz. Ed Bott, Rafael Rivera, Steve Sinchak, Paul Schottland, Lowell Heddings, Emil Protalinski, Howard Lo, James Fisher, Anand Khanse and myself, were compiled to arrive at the following shortlist of 10 websites, linked below in rough sort of alphabetical order (where 4=four and 7=seven). Does the website have substantial original quality content of interest & use to a Windows 7 and Vista user ? The Windows Club Poll: Vote for the Best Windows Website 2009. The exciting new Zune HD is available for preorder from August 13, 2009 until September 15, 2009. If you are not familiar with the features of the Zune HD, watch the video below from Grand Tour of the Zune HD, with glimpses of Bing and browser. Note, in particular, some of my favorite features, including the magnificant OLED touch screen, built-in HD receiver, browser and alphabet browsing. Sun Microsystems has released update Java SE 6u16. This update does not contain any new fixes for security vulnerabilities. If you have already installed Java SE 6 Update 15, you have the latest security fixes and do not need to upgrade to this release to be current on security fixes. From the Release Notes, BugID: 6862295, JDWP threadid changes during debugging session (leading to ignored breakpoints) was fixed in this update. Download Link: Java SE Runtime Environment 6u16. Microsoft released the new security bulletins listed below to resolve critical problem vulnerabilities. In addition to the new bulletins, Microsoft has released one new security advisory, one updated security advisory and two revised security bulletins. Microsoft updated Security Advisory 973882 - Vulnerabilities in Microsoft Active Template Library (ATL) Could Allow Remote Code Execution. On August 11, 2009, Microsoft is planning to release nine new security bulletins. Below is a summary. Note that all bulletins require a restart except Bulletin 8. However, after installing updates, it is always recommended to restart the computer. Affected Software: Microsoft Office, Microsoft Visual Studio, Microsoft ISA Server, and Microsoft BizTalk Server. Affected Software: Microsoft Windows 2000, Windows XP, Windows Server 2003, Windows Vista, Windows Server 2008, and Remote Desktop Connection Client for Mac. Affected Software: Microsoft Windows 2000, Windows XP, Windows Server 2003, Windows Vista, and Windows Server 2008. Affected Software: Microsoft Windows XP, Windows Server 2003, Windows Vista, and Windows Server 2008. Affected Software: Microsoft Windows 2000, Windows XP, Windows Server 2003, and Windows Vista. Affected Software: Microsoft .NET Framework on Windows Vista and Windows Server 2008.